Continually innovative and at the forefront of design, Riedel presents the RIEDEL BAR DRINK SPECIFIC GLASSWARE collection, made in collaboration with spirits specialist Zane Harris, known for his mixology at cocktail meccas including Dutch Kills, Maison Premiere, and Rob Roy. This new collection answers the need for cocktail-specific glassware with six glasses perfected for thousands of cocktails. notes Riedel CEO and President Maximilian J Riedel. The Highball and Rocks Glasses are specially made for the standard ice cube as well as the large format ice, a growing favorite among restaurants and bars. The Fizz Glass captures the perfect frothy and pillowy “push-pop” head of foam with its parallel sides in cocktails like the gin sour. Sized to be cradled by the hand of the imbiber favor for ultimate comfort, the Neat Glass is proportioned smaller than the Rocks glass but appears full when the ideal amount of spirit or cocktail is added. Nick & Nora, named after the characters in the timeless thriller “The Thin Man,” remembered for its mystery and martini-loving husband-and-wife detective team. The glass ensures an effortless and chic sip, delivering the drink without forcing the tilt of the head perfect. Equipped with an outward flared lip, essential for the traditional sour, the Sour Glass delivers the silky smoothness to the entire palate, directing the otherwise strong flavor profile to the tip of the tongue where it will be most enjoyed, in keeping with Riedel’s form-follows-function ethos. Each unique glass in the RIEDEL BAR DRINK SPECIFIC GLASSWARE collection is crafted in Riedel’s family-owned factories. 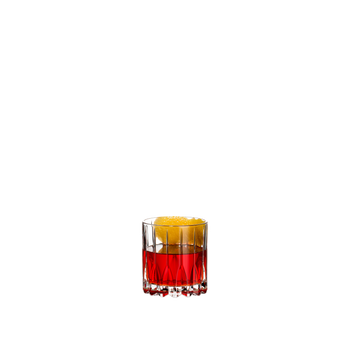 Place a white sugar cube in a chilled mixing glass and add bitters to saturate. Muddle. Add Whiskey and stir with ice. Strain into a chilled Neat glass with an Herbsaint or Absinthe rinse Spray (zest) the glass with a lemon twist.